Working shift work means my weekdays, and consquently my weekends, are a bit all over the place and usually not when everyone else is having a bit of R & R. These last few "days off" have just gone too quickly!! I've been busy catching up on things.....family, housework, cooking, you know.... just all the usual domestic goddess type of stuff, plus a few quilty things too. The next BOM has arrived this week from Auzzie - two pineapple blocks. Looks like they will sit somewhere in the centre of the "40 Shades of Grey" quilt, and both are kinda large! 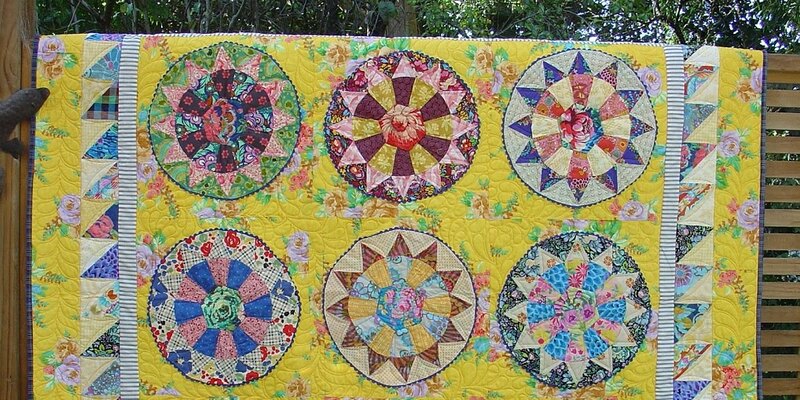 ........I made a pineapple quilt way, way back and I had a bit of trouble with the technique from memory!!! The Material Obsession fabric selection is somewhat more contempary than back in those days!!!! So it will be good to revisit this with a fresh new look & try to improve on my first attempt!! 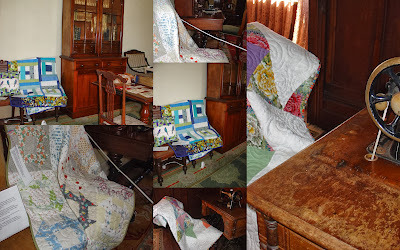 So, as you can see, lots of little quilty bits & pieces for me and now it's back to four days nursing. What has everyone else been busy sewing this week? I popped over to Highwic House today to see our Monday Modern quilt display. It was very inspiring to see all of the group's quilts on display in such a great historic setting, including three of my latest, more "modern" quilts. Yep......half square triangles HST...... you either luv them, or hate them!!! But they are so versatile & there are so - so many ways to put them together!!! I have also looked at many zig zag quilts/ chevron quilts, all of which use HST's. I found the hardest thing was actually deciding on just what sort of finished look I wanted!!!! In the end I just started sewing! I cut lots of squares at 4 3/4" ( I figure it doesn't really matter what size just so long as I am consistant). Then made them up into HSTs by ruling a line across the diagonal, & sewing 1/4" each side of the line, one after another, chain piecing. Then I cut them across the diagonal & pressed them all. After a horrendous trip to the dentist this morning I took solice in a bit of sewing. I have made up the 4 blocks for our BOM....we are playing around just a little with the provided fabrics, but in all honesty, anything goes!!! I do think the Kaffe fabrics all fit in nicely & blend with each other. And throwing in a few other fabrics seems to work just as well too, a little bit of Denise Schmidt here, a little bit of Jennifer Paganelli there, along with some Anna Maria Horner too!!!! So - here we have a very different sort of sampler quilt slowly happening! From the fabric choices, to the layout, and of course the actual blocks. 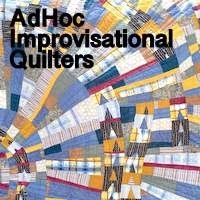 As Kathy @ MO says, there is certainly going to be lots of variety in this multi technique quilt!!! I did find a few things essential - stick to 1/4 inch seams, pin all intersecting pieces, and once I had made the 1st block, chain piecing certainly was the way to go!!! In the big scheme of things these blocks will be quite separate from each other, on point, & in four corners of the quilt later on down the track. But for now.......this month's BOM .....done!!!! Well, one of us has been busy, and it's not me!!!! Glenys popped in for a coffee today and she showed me all her completed blocks for our 1st BOM from Material Obsession/40 Shades of Grey quilt. A lovely eclectic combination of fabrics !!!!!! some Kaffe, some Alexander Henry, some personal stash. From previous experience, I feel we shouldn't over think (i.e. panic) about any fabric decisions, you know.... just go with our gut feelings. It uses a variety of techniques and is very colourful, with blocks set on point, and has lots of different fabrics, along with assorted greys to pull it altogether. I must admit the MO fabric decisions fascinate me! I am curious to see how they actually decide what will go with what. And how they use colour to create movement/texture/interest is really wonderful.........so I signed up for another BOM to learn more!!!!! The first package arrived in the mail last week. There are four criss cross blocks to make this month. Doing a BOM together does have a few benefits - we have a wee "unspoken" competition between us as to who gets their block done first! and it's proven to be a great incentive for actually doing the month's work!!!!! and we can trouble shoot any tricky bits together!!!! I guess too you'll be wanting an update of my charity quilt? Well, it's all pieced, pressed & pinned, and ready for some machine quilting. ..........and then I added some other bits & pieces from my stash. The teal/brown combo looks a bit vintage, don't you think? I have decided to make a wallpaper strips quilt, which I first saw in a Kaffe Fassett book ages ago but there are many versions around now. It's pieced from long strips cut from the width of the fabric. The strips are all cut to random lengths & then pieced in rows. Simple!